Over 65 million people are searching online every day using their mobile phones and the mobile phone is replacing your customer’s computer. The customers you want are becoming mobile users. Mobile phones outnumber PCs by about 4 to 1 and this number is rising daily. Your customers are probably already looking for you on their mobile phones. Websites built for viewing on computer screens don’t present well on mobile phone screens, which are much smaller and slower to load. Mobile sites are specifically designed to be easy to read and navigate through on mobile phones. 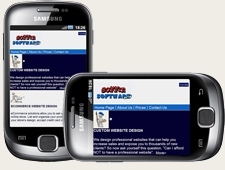 Having a mobile site provides another way for visitors to find you. Your business will be listed on the on mobile-friendly search engines such as Google and Yahoo. Your business will be placed in high traffic mobile and local directories, increasing your exposure...and more exposure equals more business! When a visitor arrives at your site while on their mobile device, it automatically and seamlessly delivers them to your mobile friendly version....and they still have the option to return to your full website with just one click!